This may seem silly, but how many of us struggle with the never-ending barrage of emails? Take a few moments to clean out your inbox- unsubscribe to a few of those junk emails, delete others. Think of starting the week with a fresh slate. If you do this every Sunday for just a few minutes, you’ll be surprised how easily you are able to keep up with your emails. When it comes to having a more productive week, this is BY FAR my most effective way to do it. I use my planner constantly. I write everything down and I am a big list maker. Every Sunday, I look at my planner and fill in my tasks and appointments for the week. I make sure to add any family commitments and work tasks. Having these tasks laid out before the week starts will allow you to jump right into them Monday morning. Doing this in the same spot and at the same time every week will help it to become a habit. What do I mean by this? I think of a command center as a place where you put anything you need to keep your house in order- cell phones, bills, calendars, lists, coupons, etc. If you work from home, clean your desk off on Sunday so you start the week with a clean desk. You can also clean off that never ending pile of mail that built up over the weekend, or the kids school books. Be sure to put anything you need for Monday morning in a place where you can grab and go. This is a non negotiable for me. If it doesn’t get done, Monday mornings are stressful. I need to wake up to a clean kitchen and a picked up living room. I enlist help from the whole family and we can get it done pretty quickly. Then we all have time to relax that night, knowing we will wake up with that calm feeling. This is something I have been doing for awhile and it makes ALL the difference. Sundays are typically the day I do my meal prep for the week. I create a basic meal plan for the week and then take some time to prepare what I can to make my week easier. This took some time to get used to, but now I don’t go a week without doing it. I can cook up a bunch of protein and chop fruits and veggies so I can quickly grab what I need during the busy week. 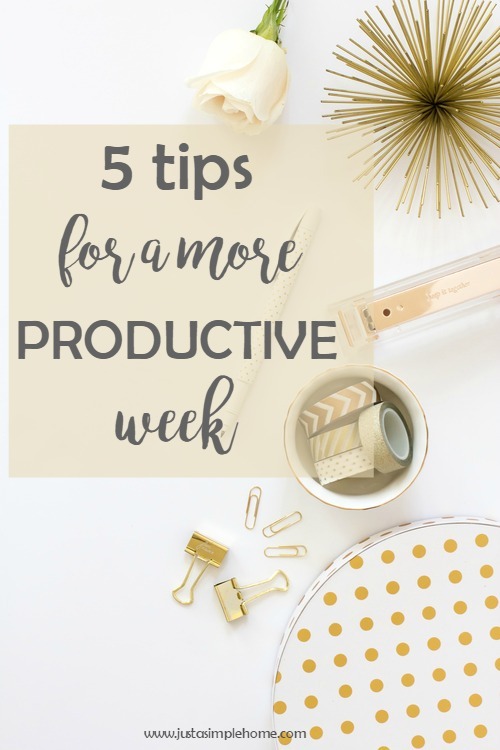 I hope this list helps you have a more productive week! If you have any more tips you can share, please let us know.